An 8-month-old female child, born out of non-consanguineous marriage, developmentally normal for age, immunized appropriately presented with complaints of fever on and off for five months and loose stools for past five days. The fever, however, was never documented and was intermittent in nature, not associated with any chills and rigors or any diurnal variation, and used to get relieved on taking oral medications. The stool frequency was 5–6 episodes per day, watery in nature, non-foul smelling, not associated with blood in stools. No history of decreased urinary frequency, lethargy, or increased irritability was found. There were no complaints of increasing pallor, bleed from any site, abdominal distension, or any history suggestive of recurrent infections. Birth and antenatal period were uneventful. There was no in-utero exposure to radiation and no history of maternal smoking. On examination, the child was hemodynamically stable without any signs of dehydration. Length was 69 cm (b/w 50th and 75th centile), head circumference 42 cm (−1 SD), and weight was 6 kg (<3rd centile). There was mild pallor, but no icterus, lymphadenopathy, petechiae, or ecchymosis were found on physical examination. The abdomen was slightly distended, with presence of bilateral, hard, ballotable masses. No hepatosplenomegaly was present. The respiratory, cardiovascular, and central nervous system examination did not reveal any abnormality. Hemoglobin was 9 g/dl, TLC – 1.76 × 103/μl with 80% lymphocytes, platelets – 100 × 103/μl, urea – 14 mg/dl, creatinine – 0.5 mg/dl, and uric acid – 13.2 g/dl, S. phosphate – L 6.2 mg/dl, ionized calcium – 4.2 mg/dl, potassium – 2.5 mEq/l, and sodium – 139 mEq/l. Peripheral blood examination showed presence of leucocytosis with peripheral blast count of 85%; red blood cells were normocytic normochromic. Bone marrow aspiration confirmed acute lymphoblastic leukemia (ALL) and showed 89% blasts, which were three times the size of normal lymphocytes, with scant amount of agranular cytoplasm, high nuclear–cytoplasmic ratio, with presence of opened up fine chromatin, and 0–1 inconspicuous nucleoli. There was suppression of erythroid, myeloid, and megakaryocyte series. The blast cells were positive for CD79a, CD19, and HLADR and negative for CD10 and MPO. Findings on immunophenotyping were consistent with precursor B-cell ALL. Contrast enhanced computed tomogram of the abdomen revealed presence of bilaterally enlarged kidneys: left kidney – 10 × 3.5 cm, right kidney – 9.9 × 5.2 cm, normal in contour and parenchymal attenuation without any hydronephrosis, calculus and with preserved cortico-medullary junction [Figure 1]. The infantile leukemias are rare entity, and they present with a more aggressive clinical features, are more difficult to treat than leukemia in older children, and have a poor prognosis. Only 2–5% of ALL cases occur in infants. The common clinical presentations of leukemia in infants and children include high-grade fever (most common – 50–60%), anemia, easy fatigability, easy bruising, petechiae, bony pains, and infections. The most common sites of extramedullary involvement in leukemias are liver, spleen, and lymph nodes. Kidneys are also sites for extramedullary dissemination of leukemias with infiltration of kidneys being reported in 7–42% cases of childhood leukemia. However, presentation with bilateral palpable renal masses at initial presentation is very rare, more so in infants. 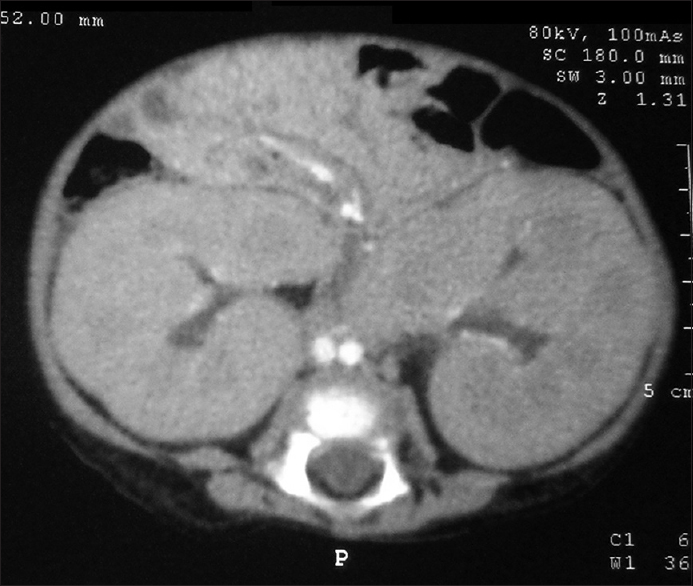 The differential diagnosis of bilateral enlarged kidneys in infants includes polycystic kidney disease, bilateral hydronephrosis due to distal obstruction (Posterior urethral valve), Wilms tumor (5–10% are bilateral), infiltration by leukemic cells, storage disorders, and diffuse nephroblastomatosis. Although leukemias usually have a high total leukocyte count at presentation, cases of ALL with nephromegaly without raised counts have been documented in children and adults. Renal infiltration resulting in bilateral nephromegaly is usually found more commonly in the late stages of the disease. The route of dissemination to kidneys is hematogenous. Rarely, in about 1% of such cases, the patients may present with acute kidney injury. The most common computed tomography finding in renal leukemic involvement is presence of focal parenchymal abnormalities with multiple bilateral masses. However, a number of patterns have been recognized which include diffuse bilateral or unilateral involvement, solitary unilateral or bilateral masses, and ill-defined parenchymal involvement. The impact of nephromegaly on the prognosis and outcome in leukemic patients is inconclusive. While a few studies reported the presence of nephromegaly as a poor outcome predictor, others suggested that kidney size as an independent factor, when adjusted for other prognostic factors, was not associated with poorer survival. Hilden JM, Dinndorf PA, Meerbaum SO, Sather H, Villaluna D, Heerema NA, et al. Analysis of prognostic factors of acute lymphoblastic leukemia in infants: Report on CCG 1953 from the Children's Oncology Group. Blood 2006;108:441-51. Hilmes MA, Dillman JR, Mody RJ, Strouse PJ. Pediatric renal leukemia: Spectrum of CT imaging findings. Pediatr Radiol 2008;38:424-30. D'Angelo P, Mura R, Rizzari C, Conter V, Bellini F, Valsecchi MG, et al. Prognostic value of nephromegaly at diagnosis of childhood acute lymphoblastic leukemia. Acta Haematol 1995;94:84-9. Neglia JP, Day DL, Swanson TV, Ramsay NK, Robison LL, Nesbit ME Jr., et al. Kidney size at diagnosis of childhood acute lymphocytic leukemia: Lack of prognostic significance for outcome. Am J Pediatr Hematol Oncol 1988;10:296-300.